Lemon is a favorite Greek addition to many potato dishes, and this quick and easy Greek potato salad relies on lemon to give it a touch of sharpness. The end result pairs wonderfully with many main dishes. Traditional patatosalata—πατατοσαλάτα in Greek and pronounced pah-tah-toh-sah-LAH-tah—substitutes olive oil for the mayo commonly used in American potato salads. This makes it virtually fat-free and guilt-free. Cut the onion into thin slices, then cut the slices in half. Peel the potatoes and cut them into large bite-sized chunks of equal size. Rinse well. Add the potatoes to a pot of cold water, enough to cover them by 1 1/2 inches. Bring the water to a boil and boil the potatoes over medium-high heat for about 15 minutes. Test the potatoes for doneness after 10 minutes. They should pierce easily with a fork when they're ready. If they're not quite there yet, keep checking in one-minute increments. Remove the potatoes from the heat as soon as they're done and drain them. Overcooking will turn them to mush when you prepare the salad. Place the potatoes in a serving bowl or dish. Add the onions and toss together. Combine the olive oil, lemon juice, garlic, salt, and pepper in a small bowl using a whisk. Add the dressing to the potato and onion mixture just before you're ready to serve and combine well. Sprinkle with the parsley. Skin the potatoes after cooking if you like. This tends to be much easier than peeling the potatoes when they're hard and raw. You can serve this potato salad warm, at room temperature, or chilled. 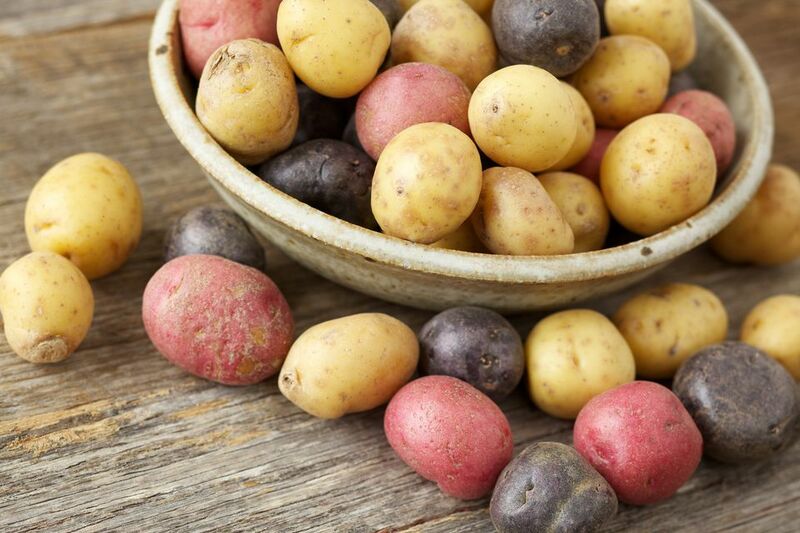 Red bliss potatoes are ideal for this recipe because they hold up well and won't dissolve as brown potatoes likely will. Using a red onion makes a nice visual effect, and many traditional patatosalata recipes call specifically for red onions. If you think you need a little dairy, sprinkle some feta cheese on top since potatoes and feta are a perfect pair. While parsley is a classic addition, you can also dress up your recipe with other herbs such as oregano or thyme. Add crumbled hard-boiled eggs for a variation. You'll need four eggs for this recipe. Just boil them while the potatoes are cooking or make them ahead of time. For more of a Greek touch, add some Kalamata olives, pitted and quartered. You might also add two to three green onions or scallions, sliced thinly.